against accidental damage to the database. • An instructor name cannot be null. • No two instructors can have the same instructor ID. • Every department name in the course relation must have a matching depart?ment name in the department relation. • The budget of a department must be greater than $0.00. is used primarily in the process of schema design. the constraint is added to the relation; if not, the command is rejected. 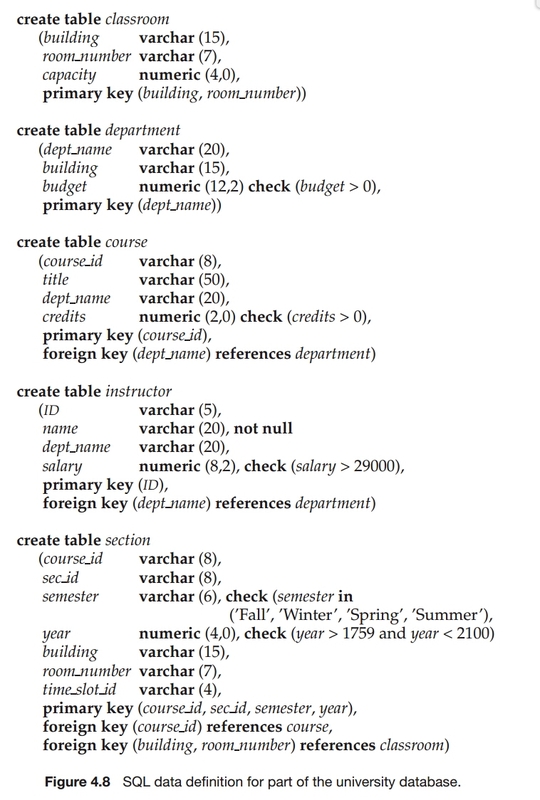 We described in Section 3.2 how to define tables using the create table command. We cover each of these types of constraints in the following sections. The not null specification prohibits the insertion of a null value for the attribute. declared to be not null generates an error diagnostic. university example, in the departmentrelation, if the attribute dept nameis declared as the primary key for department, it cannot take a null value. As a result it would not need to be declared explicitly to be not null. key; that is, no two tuples in the relation can be equal on all the listed attributes. P that must be satisfied by every tuple in a relation. would ensure that the value of budget is nonnegative. programming-language type systems do not permit. widely used database products allows the predicate to contain a subquery. condition is called referential integrity. r2, there must be a tuple t1 in r1 such that t1.K1 = t2..
than one tuple in r1 can have the same value for attributes K1. are described in Section 4.4.7.
the field dept name in the referencing tuples in course to the new value as well. deletion or update at one end of the chain can propagate across the entire chain. by the transaction and its cascading actions are undone. automatically to satisfy the constraint. executing a statement set constraints constraint-list deferred as part of a transaction causes the checking of the specified constraints to be deferred to the end of that transaction. immediately, and many database implementations do not support deferred con?straint checking. cannot be set to null. these constructs are not currently supported by most database systems. modified in relation time slot). subqueries were supported by a database system. Figure 4.9 An assertion example. relation because that relation is referenced in the subquery. equal the sum of credits of courses that the student has completed successfully. “not exists X such that not P(X)”, that can be expressed in SQL. We leave the specification of the second constraint as an exercise. or to provide specialized forms of assertion that are easier to test. in Section 5.3, if they are supported by the database system. Section 5.3 also describes how the referential integrity constraint on time slot id can be implemented using triggers.